If you often use the same layout or data in a workbook, save it as a template so you can use the template to create more workbooks instead of starting from scratch. 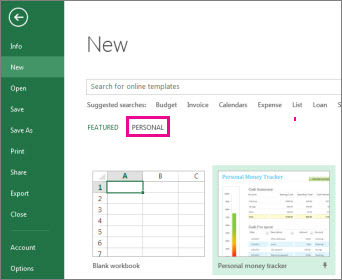 You can use one of your own templates to create a new workbook, or you can use one of the many predefined templates that you can download from Microsoft Office Online. This path is typically: C:\Users\[UserName]\Documents\Custom Office Templates. Open the workbook you want to use as a template. With the template you created above, you can create a new workbook. This section tells you how to do that. Note: Alternately, you can browse for various online templates in Excel and use them instead. For more information, see Download free, pre-built templates. Open the workbook that you want to use as a template. The template is automatically placed in the Templates folder to ensure that it will be available when you want to use it to create a new workbook. 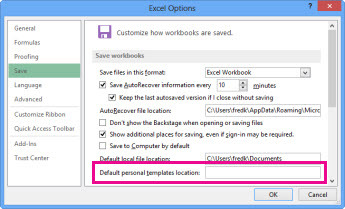 Tip: You can copy any Excel workbook into the Templates folder, then you can use the workbook as a template without saving it in the template file format (.xltx or .xltm). In Windows Vista, the Templates folder is usually C:\Users\<your name>\AppData\Roaming\Microsoft\Templates. In Microsoft Windows XP, the Templates folder is usually C:\Documents and Settings\<your name>\Application Data\Microsoft\Templates. To base the workbook on a recently used template, click Recent Templates, and then double-click the template that you want to use. To base the workbook on an installed template, click Sample templates and then double-click the template that you want to use. To base the workbook on a template that you created, click My templates, and then on the Personal Templates tab, double-click the template that you want to use.